As your senses rejoice with our Mexican Sweet Chili, picture yourself at a lively fiesta as the sun sets over the enchanting Mexican landscape. This spirited blend combines the intensely rich aroma of cocoa with the invigorating spice of cayenne. And with an added hint of cardamom and ginger, it's sure to revive your spirit and refresh your energy. You'll delight with every sip, so raise your cup in celebration and spread the joy. 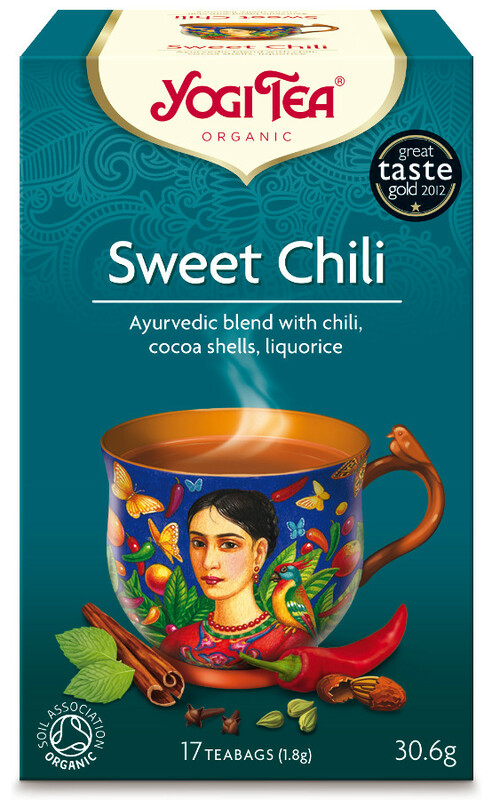 To enjoy the invigorating spice of our Mexican Sweet Chili, allow to steep for 5 minutes or longer. For a stronger flavor, use 2 tea bags. Try a delicious twist by adding your favorite creamer and sweetener to this tantalizing tea delight. Organic Licorice Root, Organic Cocoa Shells, Orange Peel, Organic Ginger Root, Organic Fennel Seed, Organic Anise Seed, Organic Cinnamon Bark, Natural Tangerine Flavor, Natural Orange Flavor, Organic Cardamom Seed, Organic Clove Bud, Organic Cayenne, Organic Black Pepper. 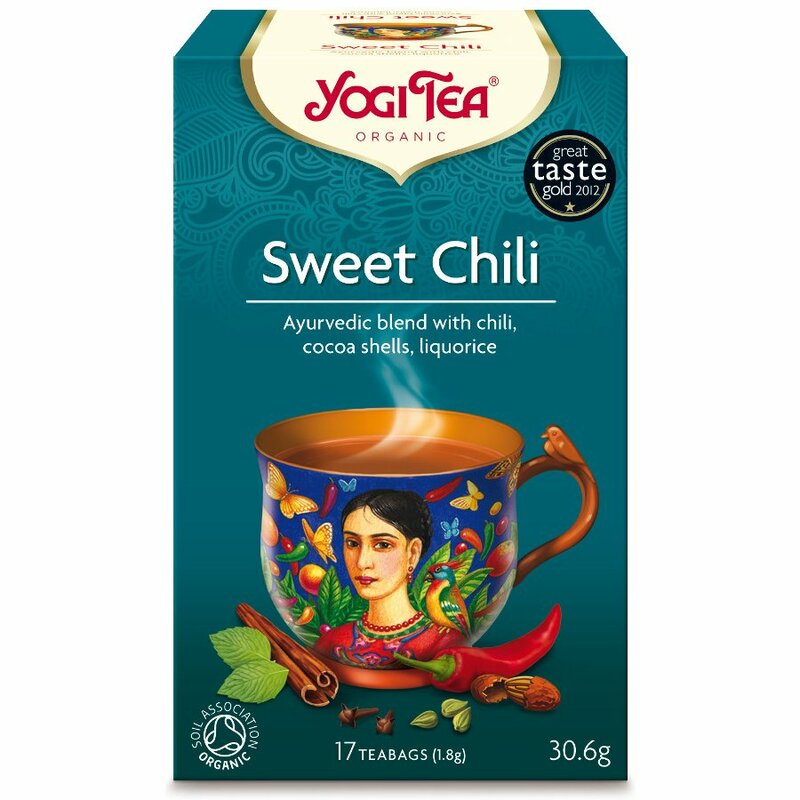 The Yogi Sweet Chili Tea x 17 bags product ethics are indicated below. To learn more about these product ethics and to see related products, follow the links below. There are currently no questions to display about Yogi Sweet Chili Tea x 17 bags. Yogi Tea create delicious teas from herbals through to green teas to promote health and wellness in our bodies. Inspired by a spiritual leader in 1969 called Yogi Bhajan who studied in India, Yogi Tea believe it's not just about tea, it's about a lifestyle. Yogi Bhajan used to serve a special tea to students after teaching them about knowledge and wisdom, and it is this tea that became known as "Yogi Tea". Yogi Tea now work with farmers to gather organic herbs and spices across Guatemala, India, Indonesia, Africa, Europe and beyond, but remain true to the ancient traditions from Yogi Bhajan, who first created these original teas.